Rodger Griessel, an exceptional Navy Commander, law-enforcement officer, helicopter pilot, husband, father, grandfather and Padres fan, died on November 13, 2016 at the age of 79. His wife Gayle, son Scott and daughter-in-law Anna had the privilege of being with him at Grossmont Hospital in La Mesa, California when he finally cast off of his failing body. Throughout a long and debilitating illness at the end of his life and he was loved deeply, and still is. Rodger is the son of Alice and George Griessel, and brother to Janet, who survives him. He was born in 1936, raised in Oradell, New Jersey, attended Rutgers University and came to California as a Navy helicopter pilot, flight instructor and eventually a Lieutenant Commander. He met Gayle in San Diego and decided to marry her on their first date. It must have been a good idea. They recently celebrated their 55th wedding anniversary. In 1966 Rodger completed his military active duty, though he continued his service as a Commander for a navy squadron in the Naval Reserves until 1979. He found his true calling in law enforcement. Like many deputies, he worked for a time on patrol and in the county jail. 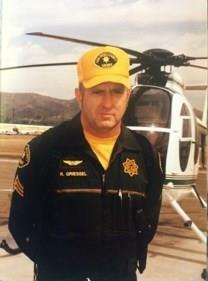 However, he is best remembered and admired for his work with ASTREA, the San Diego County Sheriff’s Department helicopter squadron. In 1971 Sheriff John Duffy called on Rodger to be part of a team that would make take the squadron from concept to reality. He was assigned as the county’s first law-enforcement pilot and ASTREA’s Operations Sergeant. In 1980 the rains came to San Diego, resulting in devastating and dangerous floods. Rodger was later commended by the county and the Sheriff for his role in more than 80 daring helicopter rescues that year. During off-duty hours, Rodger earned a degree in Criminal Justice from San Diego State University. Rodger retired from the Sheriff’s Department in 1994 and turned his attention to travel and sports. When he wasn’t exercising on the deck of a cruise ship or out to dinner at some great local bistro with Gayle, he was likely knocking the covers of softballs and throwing runners out from center field. He spent much of his retirement as one of the San Diego senior softball scene’s big hitters and savvy outfielders. On days when he wasn’t needed to bring up the team batting average and take down long fly balls, he played competitive racquetball, worked in the yard and coached the Padres from his chair on the patio. His passing leaves a space that can’t be filled. He was a good man, a devoted husband and an exceptional father. Rodger’s family held a private service graveside on Tuesday, November 22. Arrangements under the direction of EI Cajon Mortuary & Cremation Service, El Cajon, California.